It has been years since I have read a comic book. When I was younger, I used to read them regularly. This did include the Archie comics. Yet, when I was reading them, the characters were portrayed as more innocent. This version of the Archie comics has the characters portrayed as sexier. 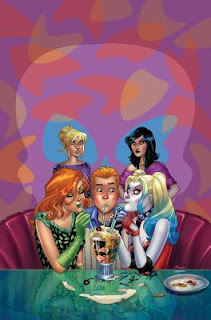 However, this storyline has the characters acting like highschoolers including Poison Ivy and Harley Quinn. No, I want the bad guys to be "evil" not making me think they are all going to be friends over ice cream floats. In fact, I was disappointed in this book and the good two shoes vibes that I was getting from the storyline that after reading to the half way mark I skipped ahead to the last couple of pages just to see how the story would end. Still not impressed. This comic did not get me excited to read comics again. It was a yawn fest.